Ibrox Noise: Warburton tried to sign him - should Stevie move again for 27-year old? Warburton tried to sign him - should Stevie move again for 27-year old? If Rangers need one sole position fixed before February, it’s clearly attacking midfield. While Steven Davis’ signature was a move in the right direction, there remains a criminal lack of creative talent behind Alfredo Morelos, with Rangers’ last effective number 10 or 8 being the now departed Josh Windass. But back in 2015 when Mark Warburton took over, Rangers were heavily linked to a player the ex-manager knew well from his Brentford days – the name of Jota didn’t excite fans back then given the best he could seem to do was a loan out to Eibar from England’s Championship, and back in those days Rangers seemed to be linked to every single second-rate player from League One and Two, not to mention the dregs from England’s second top flight. In fairness to the now 27-year old playmaker, his career may not have panned out at the marquee top of the game, but Championship Birmingham paid a club record £6M for him in 2017 and while he’s not quite been Maradona for them, could he be a left-field recruit who could give Rangers a touch of reliable class at the top of midfield? 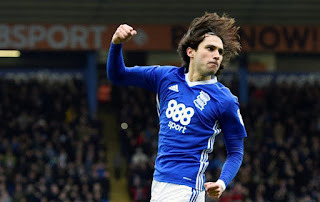 His stats for the two seasons he’s spent in Birmingham are respectable; 32 appearances last season, five goals and two assists, whereas in the 23 appearances he’s made this campaign it’s basically reversed, with one goal and five assists. Jota is a quick, pacy dribbler with the eye for a pass – he plays on the edge of the box and uses wingers around him, as well as being able to find strikers in the box. But the fact his career has been in the lower leagues of England and Spain does suggest he’s one an ambitious bid for could actually have a chance of securing. His contract expires in 2021 and his current value is claimed to be almost £2M down on the transfer fee paid for him. Would this be a big spend? Yes. But for all those guffawing at the idea of our suggestion – the problem is attacking midfield is one of the hardest positions to play – knowing who to play through, when to hold onto the ball, when to make runs, and having vision to get strikers onside. It’s one of the most expensive positions on the pitch, and unless Rangers fork out some hard cash for a player like Jota (or anyone else) the best we can hope for is a Bosman or an inexperienced kid on loan who won’t know the first thing about the slot – think Ovie Ejaria and you’re getting there. England’s Championship is probably the best place to get a half decent player for this position – Jota is only one example. The time of signing garbage in the top flight should be left in the Warburton and Caixinha eras – for Rangers to take the next step will require serious spending. Not outwith our means, on no level are we suggesting that, but after we finally dealt with the issue of not spending as much as £1M on a player for years, we have since broken that up to and beyond £3M. And the occasional signing of that value will be necessary to keep our progress going. And someone like Jota would be a pretty good addition. I understand the reasoning. But at that age it is unlikely that he will significantly improve and therefore has no sell on value. We might as well have kept Windass, which would have been my choice incidentally. But if we go 4-4-2 than the need for a lockpicker reduces. In attack there are 4 players to look for, two strikers and two wingers. Mind you, 3-5-2 brings us back there. I would rather we looked to find and develop a younger player. Jota is ok, but we need better than ok. I think we're going to have to look outside the UK for player to fill this role. Championship players are over priced for what you get. We'd be better looking in the German, Belgian, Dutch & French leagues now that our stock is on the up. Agree we need to spend bigger to fill this position but Jota seems like one that is just too risky. I hope in the summer we will spend the £10m we spent at the start of this season on just 2 or 3 players. That would bring us better quality in key positions and possibly reduce our dependency on loan players.